Akihabara, or Akiba for short, is the birth place of AKB48. For those who are not familiar with the J-Pop (Japanese pop music) group, AKB stands for Akihabara/Akiba, and 48 is the number of girls in the group. The all-girl group is divided into a few teams, and they have daily performances at their theatre which is also located nearby, also in Akihabara. 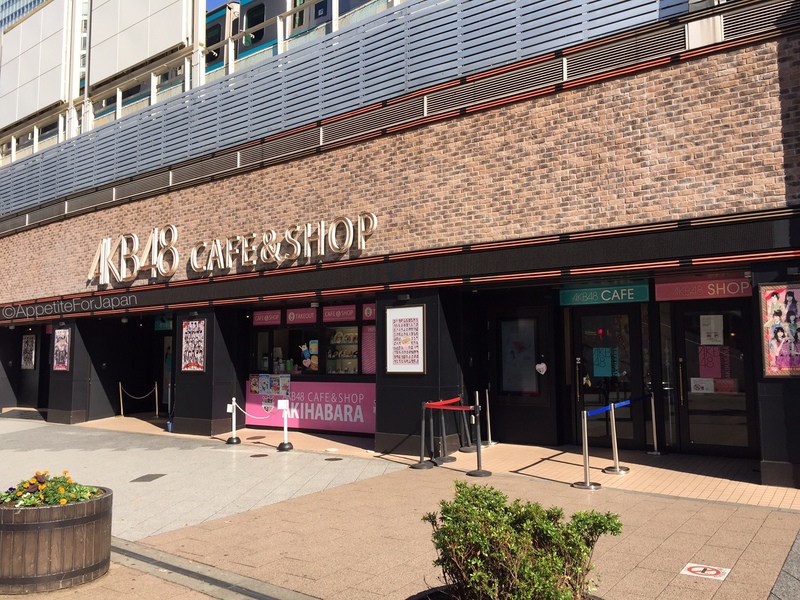 Note that there is a small theatre attached to the AKB48 Cafe, but this is not where the live shows take place. 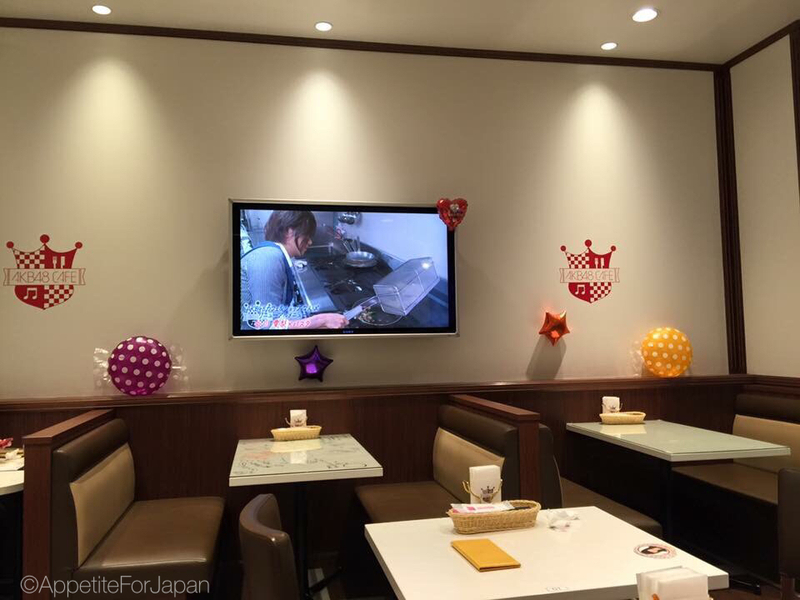 The theatre in the cafe has a movie screen where recorded performances are shown. 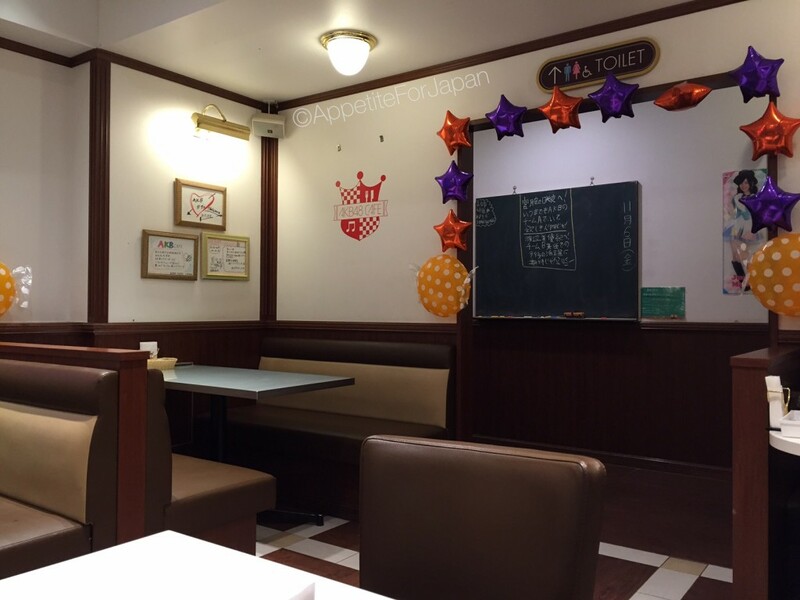 The menu is fairly small and mostly consists of light lunches and a few desserts. 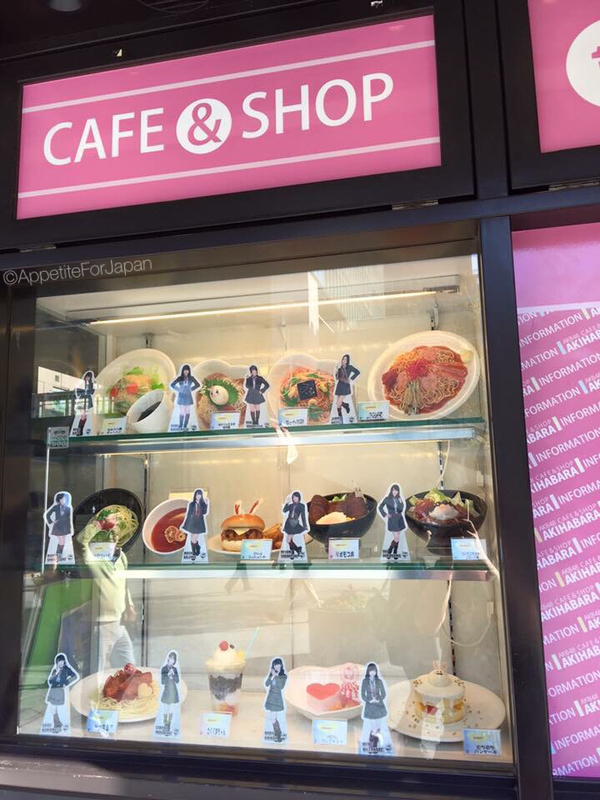 There is a window out the front of the cafe with a display of fake food, along with little pictures of the group members who supposedly like the meals. 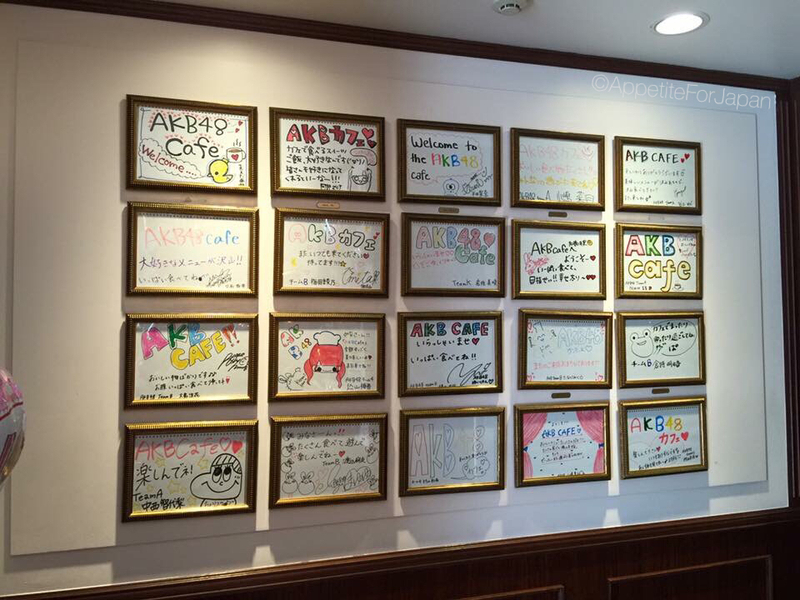 You can find the menu on the AKB48 Cafe website. Above: It had a bit of a classroom feel to it with the drab decor and the blackboard in the background. 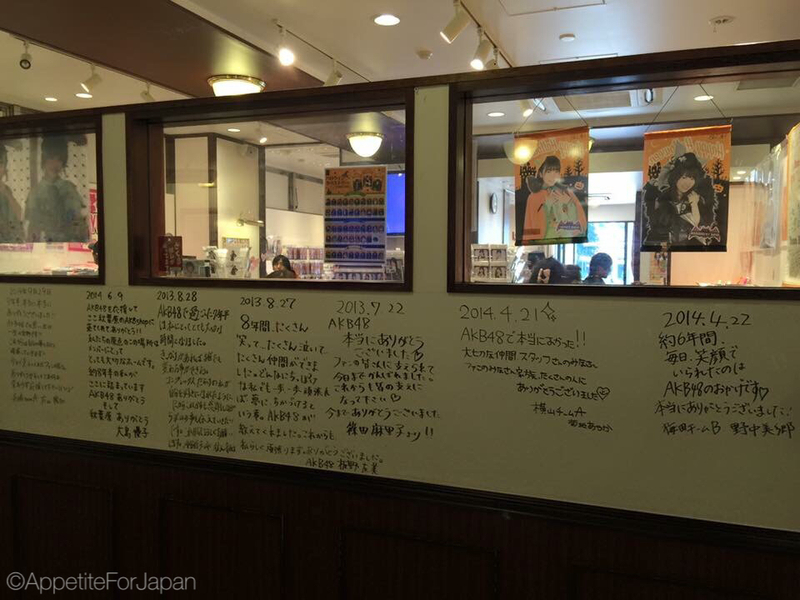 Above: Messages from group members on the wall between the cafe and store (that’s the store that you can see through the windows). Above: Framed messages which I assume were drawn by group members. Above: A blackboard in the hallway where the restrooms are located. 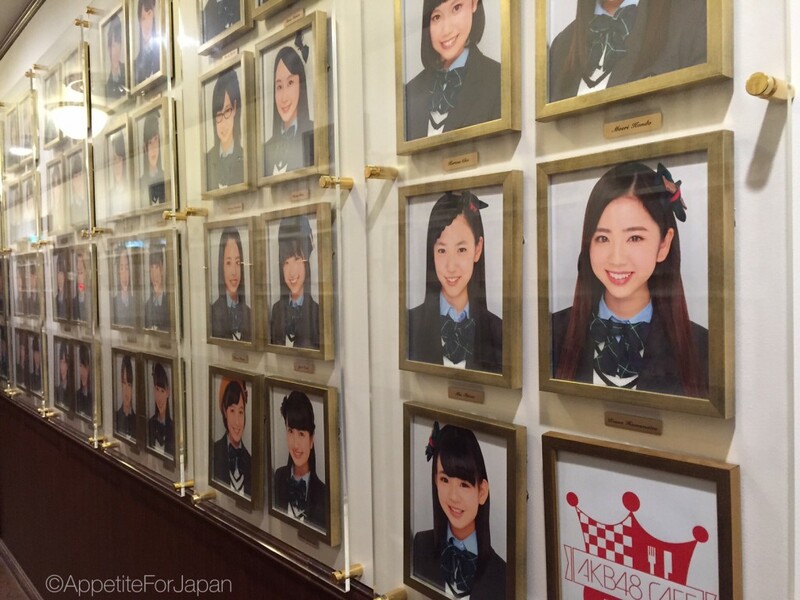 There is definitely a bit of a school theme happening at the AKB48 Cafe. 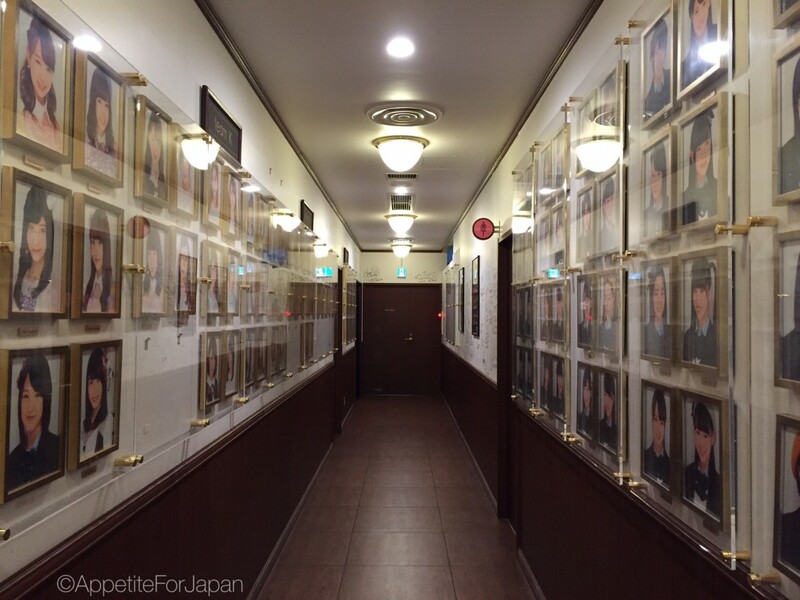 Above: As you walk down the hallway to the toilets, there are many photos of the group members. Above: More photos. These look a little like the portrait photos that you get at school. Above: On the walls in the corridor near the bathrooms, there are also messages from members of the group. Above: We ordered an iced cafe mocha – strawberry flavored (500 Yen) and a cafe latte – strawberry flavored (500 Yen). The strawberry iced coffee seemed overpriced given it’s very small size, but the strawberry cafe latte (which looked more like a cappuccino to me) was quite large and therefore better value for money. Both drinks came with a coaster which we selected at random from a stack (they were all face down and we just received whichever one was at the bottom of the stack). 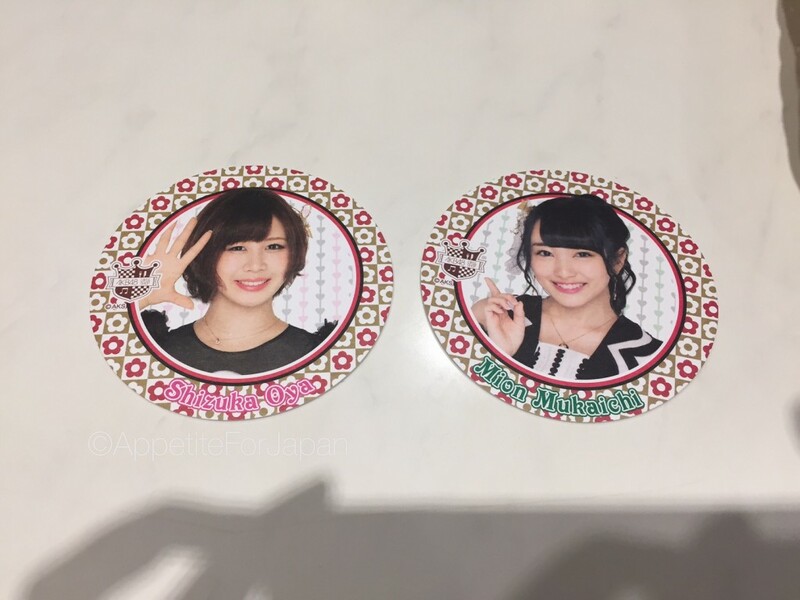 The coasters, of course, feature photos of the AKB48 girls. Coasters seemed to be rather a big deal to some of the other customers – men in their 40s and 50s. Some of them had display folders full of coasters and were laying duplicate coasters on the table in the hopes of trading with other customers. One man sitting near us kept going to check out the coasters of another man sitting nearby, and each time he did this, a waitress would rush over and tell him to go back to his own table. 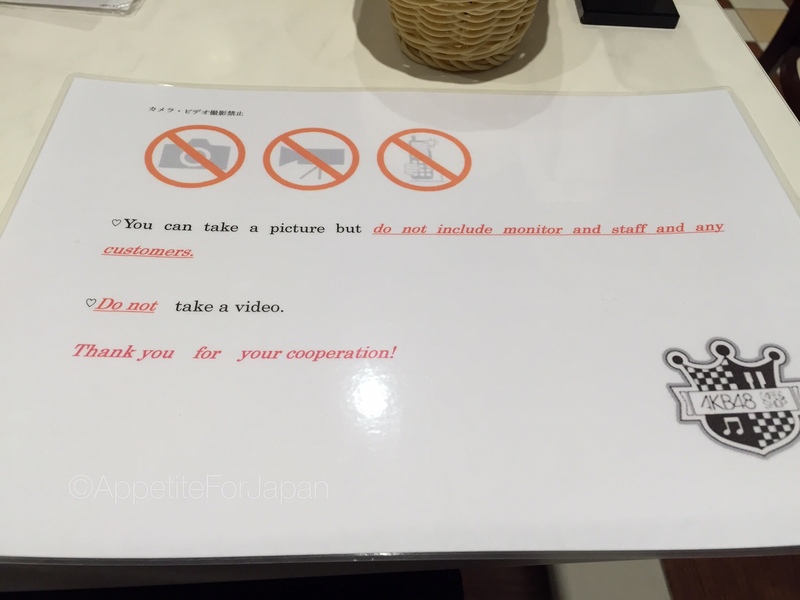 At the AKB48 Cafe, you are allowed to take photos, but you are not allowed take photos that include the monitors (TVs on the walls), staff or any other customers, and you are not allowed to take videos. I didn’t have any trouble taking any of the photos in this post as I didn’t break any of the above rules (my partner took a photo which does feature on of the TV screens before he read the rules, but nobody noticed). We wanted a photo of the bar (above), so we asked permission, the staff were happy to oblige – they stepped out of the way for a moment so that we could take our photos. After all, the rules are in place not so much because of regular tourists like us, but for the customers who might attempt to take inappropriate photos of the waitresses who wear school uniform inspired outfits, a lot like what members of AKB48 wear. 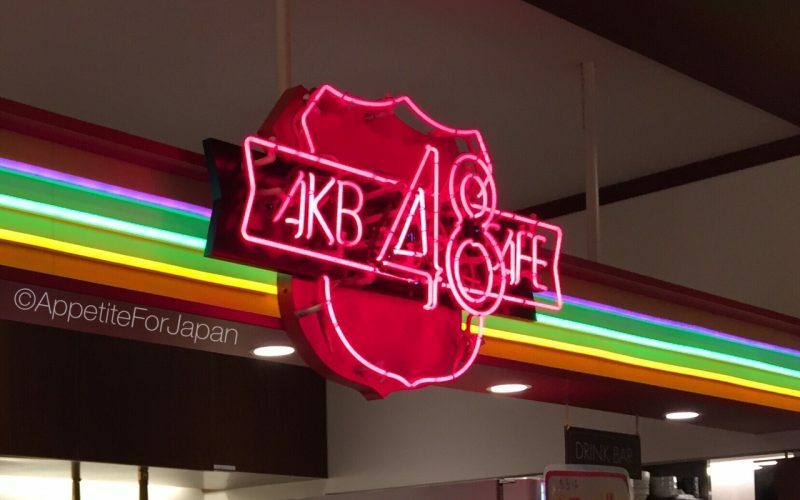 Would I recommend the AKB48 Cafe? 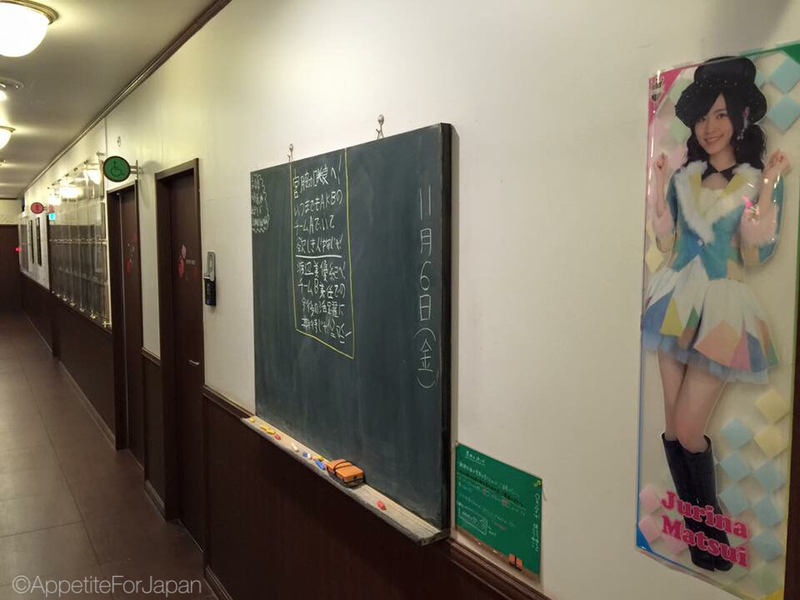 If you’re a big fan of AKB48 and you happen to be in the area, then sure. Otherwise, probably not. There was nothing really wrong with it, but as I don’t have any particular interest in AKB48, I think a lot of the novelty was lost on me. 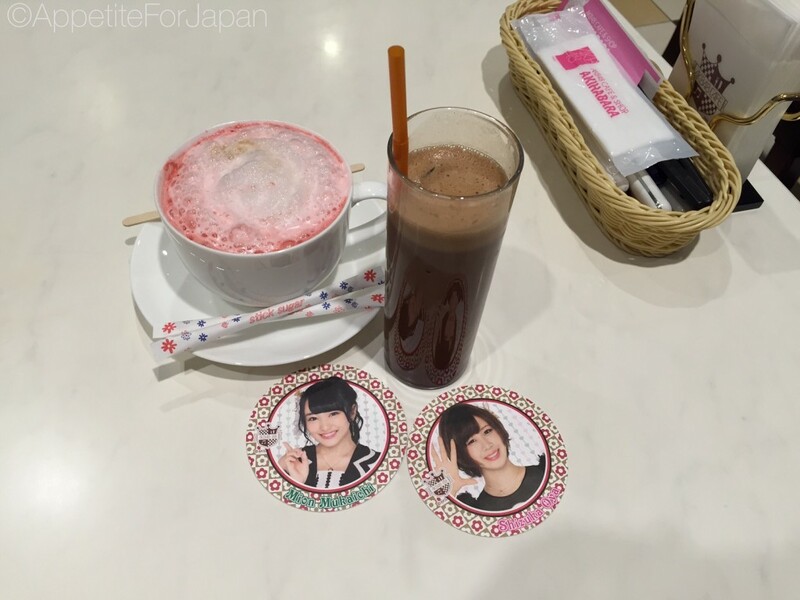 By far the most interesting part of the visit was seeing the other customers – the men in their 40s and 50s trying to trade their many, many AKB48 coasters whilst being scolded by the waitresses for not remaining at their designated tables. 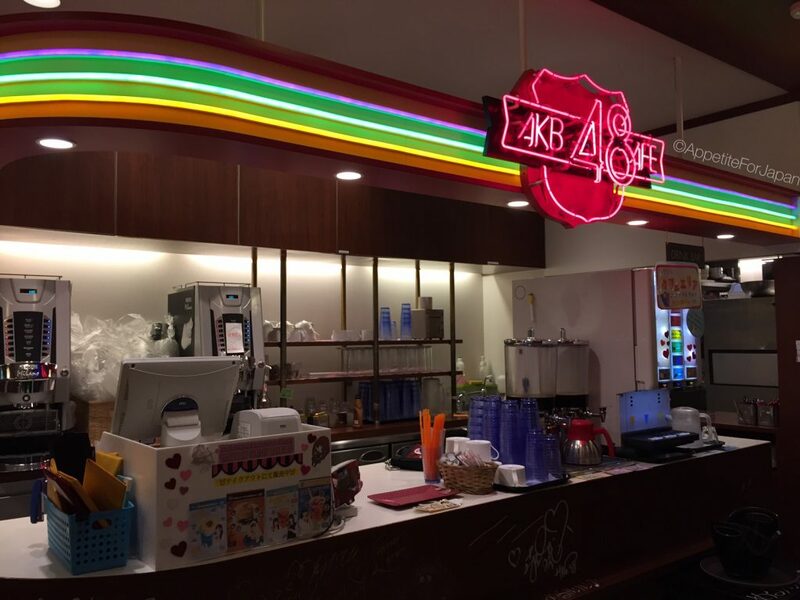 What I did like about the AKB48 Cafe is that it is completely non-smoking, unlike the Gundam Cafe next door, and unlike many eateries in Japan. Catch the train to JR Akihabara Station and take the Electric Town exit. It’s right by the station. 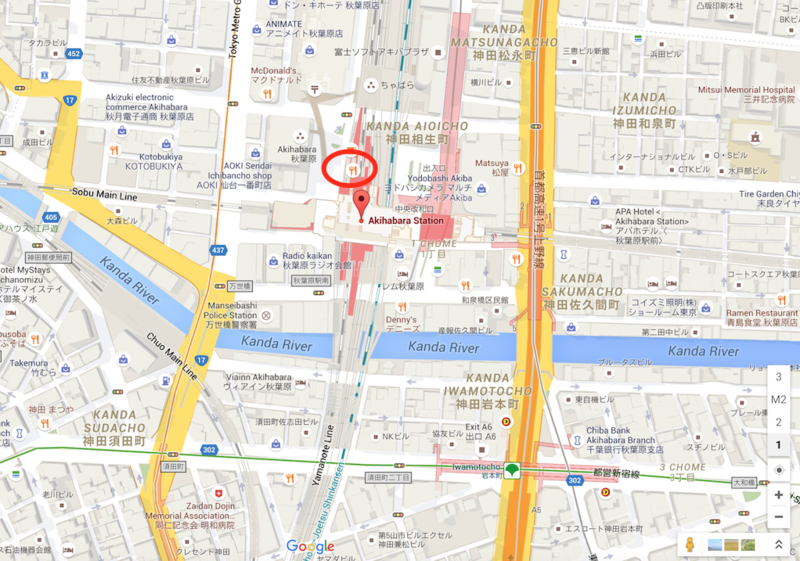 See the below map (thanks to Google Maps) to see how close it is to the station – I’ve circled the location in red.